Scott Nye is part of the golfing Nye family that includes Wayne County Sports Hall of Famers Bob Nye, his father, as well as his older brother Greg. Both Greg and Scott Nye were All-Ohioans at Wooster High and All-Americans playing for their father at The College of Wooster. Scott, the middle of three brothers, capped his four seasons on the Wooster High golf team in style. 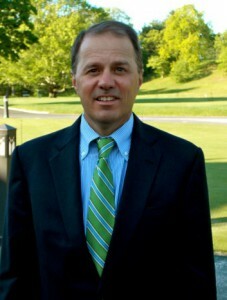 Nye was a member and co-captain of the General golf team that won the 1980 Class AAA state championship, the first team title in school history. Nye was a three-time state qualifier, and in Cardinal Conference play was a two-time individual champion. At The College of Wooster, Nye was a four-time first-team all-conference selection. The Fighting Scots won the 1985 North Coast Athletic Conference championship, led by Nye’s individual title. Nye was a rare four-time All-American for the Scots, earning honorable mention honors his first two years, a third-team selection as a junior and went on to end as a first-team All-American as a seniuor, a year in which he also captured the school’s Manges Award as the outstanding senior athlete at Wooster. Nye went on to become a member of the Professional Golfers Association, and is a 23-year member of the Philadelphia PGA Section. He has also been a staff member for Titleist for 27 years. Nye was the head golf professional at the Country Club of York from 1990-2000, site of 1999 United States Junior Amateur Championship (USGA), and since 2000 has been the head pro at storied Merion Golf Club near Philadelphia, ranked as America’s seventh-best golf course, which has been, during his tenure, the site of 2005 United States Amateur Championship, the 2009 Walker Cup Matches, and will be hosting the 2013 United States Open Championship. Professionally, Nye is a two-time Horton Smith Award Winner for contributions to education (1996,1997), has been a Philadelphia PGA Special Awards Committee Member twice, and Golf Business Journal has named Merion one of America’s Top 20 Private Golf Shops seven times.